MPs have approved a backbench business motion calling on the government to abandon entirely its now-delayed pilot cull of badgers in England. The motion, tabled by Green MP Caroline Lucas, was passed by 147 votes to 28 on 25 October 2012, majority 119. Earlier in the debate Ms Lucas said: "A cull would not be effective and could potentially be counter-productive." But DUP MP Ian Paisley backed the cull arguing that no more taxpayers' money should be wasted on unsuccessful attempts to stop the spread of the disease. He said it was "piffle" to suggest that the emotive subject was a matter of "town versus country". 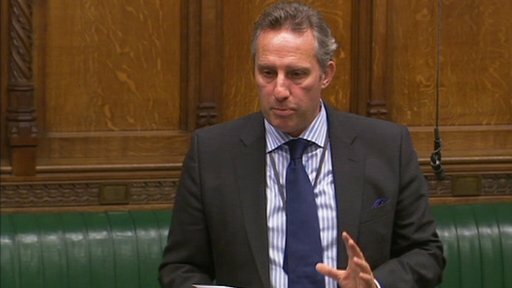 The North Antrim MP said it was about good animal welfare and the "food that we actually eat". The backbench business motion suggested a vaccination programme for badgers and cattle instead, as well as improved testing and biosecurity. But Mr Paisley said it was "nonsense" there was a readily-available vaccine that could stop the spread of the disease among badgers, telling MPs that animals already infected cannot be cured. Ms Lucas countered that the vaccine slowed the "progress and severity" of the disease in an affected badger, thereby reducing the risk of it being passed onto others. But Mr Paisley told MPs that a cull in the Republic of Ireland had resulted in a "significant reduction" in the number of "confirmed new infections" among cattle herds. He joked that he was "happy to concede" that the UK could learn lessons from the Irish Republic. Labour's Nic Dakin welcomed the pause in the cull because it allowed time to properly exam how to "sensibly progress" with dealing with the "terrible disease". Conservative MP Jacob Rees-Mogg drew a comparison between the growth in the badger population and the rise in TB among cattle. "Can it be purely coincidence that Scotland, which has a relatively low badger population, has very little bovine TB but the west of England, including God's own country, Somerset, has the highest incidence of bovine TB?" Mary Creagh said Labour had warned the government for two years that the cull would be "bad" for farmers, taxpayers and wildlife. The shadow environment secretary said the cull had already cost the taxpayer "well over £1m" and this would continue to rise unless ministers cancelled it "definitively". She predicted the cull would never go ahead. Replying for the government, David Heath said bovine TB was "spreading like wildfire" and the government could not afford to shy away from tackling the disease. He said critics had not come up with a "single workable alternative" to the cull, arguing that "all the evidence" supported a badger cull as the right thing to do. It could cost us £1bn over the next 10 years if we do not take action now, the environment, food and rural affairs minister argued. "We need to accept that we're at the point where cattle measures alone are not enough to prevent the spread of disease in the worst affected areas. "That is why this government supports a policy of badger control as part of a package of measures to tackle bovine TB."